My husband and I had the pleasure of having lunch with Sheldon Butts and his girlfriend, Rhonda Green, at Diangelo’s on Front Street. The food was great and so was the conversation. Rhonda and I spent more time talking to each other than anyone else. In our defense, we arewomen. I looked over the pictures of artwork Sarah is responsible for doing. Some were paintings, some drawings, but all were absolutely beautiful. There are a couple of artists in my own family so I learned to appreciate good art when I see it. Those pictures tell me that Sarah has a lot of talent and she will do very well in the art world. “They say artists are very creative and intelligent people,” I said to Rhonda. “These are amazing,” I marveled, as I reviewed the artwork. 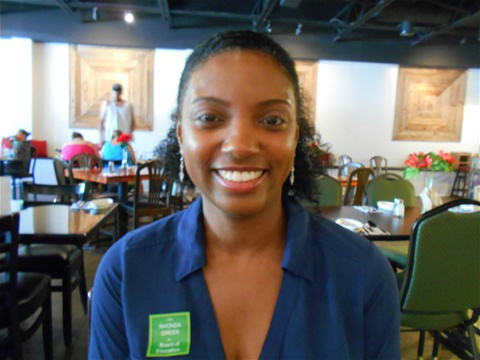 At present, Rhonda works as a legal assistant, but she wants to run on the Democratic ticket for Georgetown County School Board. She is looking for a seat in District #4 of the board. “Why school board?” I asked. “There are a lot of reasons,” she answered. “For one, I’d like to help build a relationship between the school system and the community by getting the parents more involved with their child’s education. It helps the student build their academic abilities when the parents and teachers work together. It creates a ripple effect when everyone becomes involved. “I also want to be more involved with the teachers. I don’t want to be one of those that just sit on the board without knowing what’s going on. I want to hear from the educators and get their opinions. By doing this I hope to decrease the amount of testing we do and allow the teachers to teach. The goal is to eventually have teachers teach children how to think for themselves. This builds their (students) needs mentally and emotionally, as well, because the child will be more confident in their own abilities. The student will become more self-sufficient and have self-appreciation (ripple effect)." While we ate, we continued to talk about different inspirations and trials and tribulations we’ve both had. We talked about our Faith, and, of course, we could not leave the table without talking about Sheldon. They’ve been dating for several months. “We’ve actually known each other for most of our lives,” Sheldon offered (I’m surprised he got a word in at all. Rhonda and I must be losing our edge). “And you’re just now getting around to dating?” I mused. “What did you study?” I asked. Sheldon has not officially proposed yet, but I am positive that when he does, it will be a spectacular event. No one will have to ask Rhonda whether he has asked yet because she will be walking around in a glow. I so enjoyed our lunch together. Good food and good company is always a good combination. They are such an adorable couple together and I wish Rhonda the best of luck in her run for Georgetown County School Board.